Playing with registry is one of my hobby. Today I am going to explain you a nice way to add any application to the right-click menu of folders in Windows by editing registry. It might be useful for you as you can open your most frequently used applications just by right clicking on folders. So lets start. I will add Notepad to right-click menu of folders here. You can add any other application that you use most frequently using this method. 1. First of all open registry editor. To open registry editor press Ctrl+R. Now type regedit in RUN window and press enter. 2. Now go to HKEY_LOCAL_MACHINE -> SOFTWARE -> Classes -> Folder -> shell. 3. Right click on shell and make a new Key. You can name it anything. I will name it as notepad. 4. Now right-click on newly created key (notepad) and create a new key value again and name it as command. 5. 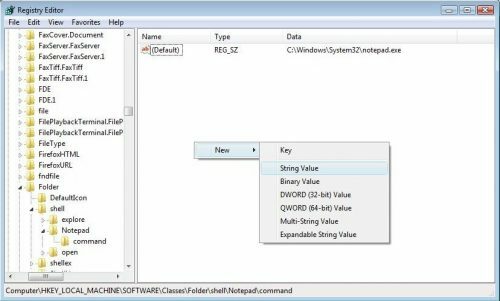 Under command key value create a new String Value by right clicking anywhere under commend key.